Gemco President Mark DiVenere meets with a Gemco toolmaker to discuss inspections and upgrades to existing tools. Photo by Mark Langlois. Gemco Manufacturing offers a diverse range of metal forming equipment, significant capacity, and a proactive design team to assist in the fabrication of custom tooling for production of high-quality, precision metal components. Since 1943, Gemco Manufacturing Co. has manufactured custom precision parts like electrical connectors, spring clips, and terminals, all produced from high quality tools that continue to be designed and built in-house. The firm’s progressive dies and fourslide tooling, built to exacting standards, turn out parts for the automotive, medical, telecommunications, and consumer electronics industries. They’re also used to manufacture parts for hardware, power tools, and residential and commercial lighting, among other applications. In 1943, Gemco was stamping parts like flat springs, contacts, switch leafs, and connectors at its Plantsville, Connecticut factory. Those parts were used in the manufacture of children’s toys and games, toasters, thermostats, and a wide variety of products beyond that. At that time, Gemco was primarily a fourslide manufacturer, with power presses and secondary operations often used to complete some of the more complex components. In 1988, the company added production presses to its manufacturing processes and, in 1994, in-house Wire EDM capabilities. The addition of Wire EDM technology provided Gemco with the ability to produce higher-precision fourslide and progressive die tooling. Today, tools and technology such as Solid Works and upgrades to the Wire EDM process all play a part in the design and manufacture of customers’ tooling. 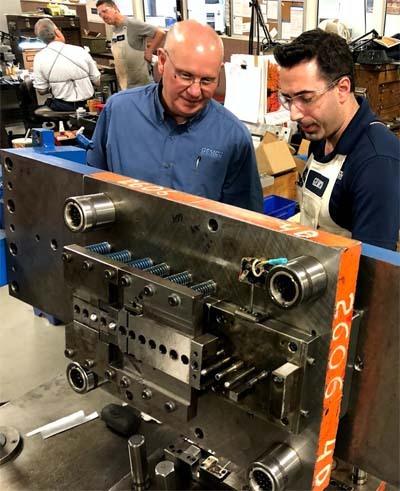 “We’re a third-generation progressive die, fourslide, metal stamping and wire forming firm with 54 slides and 12 power presses,” said Mark DiVenere, company president, in an interview at Gemco’s plant in Southington, Connecticut. 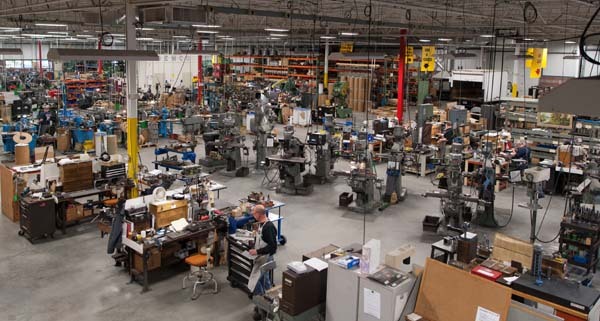 These days, the modern 40,000-square-foot Southington plant houses the talented personnel and machinery that produce terminals, terminal blades, flat springs, connectors, spring clips, heat sinks, surgical tray hardware, and power busbars. In addition to these custom stampings and wire forms, Gemco produces components that include features such as tapped holes, inserted contacts and rivets, as well as reel-to-reel applications where terminals are produced on continuous bandoliers for customers that incorporate automation in their manufacturing processes. Mark DiVenere is the grandson of Dominic DiVenere, a co-founder of Gemco with four other partners who started the company in 1943 while working full-time jobs with other manufacturing firms. Over the years, the other founding partners left the company, and Dominic DiVenere assumed full ownership in the late 1970s. Dominic, then chairman, passed away in 2000. His son, Peter, who began his employment at Gemco in 1960, led the company as president from 1986 until his passing in 2005. Mark, who began working at the company in 1986, took the reins from Peter. Gemco has customers across many major industries, including lighting controls, automotive clips and fasteners. medical trays, telecommunications, home appliances and power terminals. Gemco also manufactures components for the aerospace industry along with some components that are used in both commercial and military applications. “Gemco has effectively worked to diversify our customer base in order to better insulate the company from instabilities that may arise in particular industries,” DiVenere said. This clamp, produced by Gemco Manufacturing, is part of a light assembly made from high carbon steel on a fourslide machine. Photo by Mark Langlois. Gemco (www.gemcomfg.com) turns out 15 million tinned-brass parts per year that include contacts which are inserted in the progressive tool. The company uses real-time monitoring systems and sensors incorporated into the tools to ensure that each part has the contact. The customer uses automated equipment to manufacture its product, and a single failure would be significant. Examples of parts that Gemco can hold to within plus or minus 0.005-inch tolerance include terminals used in switches, dimmers, and motor assemblies; automotive interior lighting; surgical tray inserts; small components for medical devices and hand-held scanners; and control pad components for home appliances. 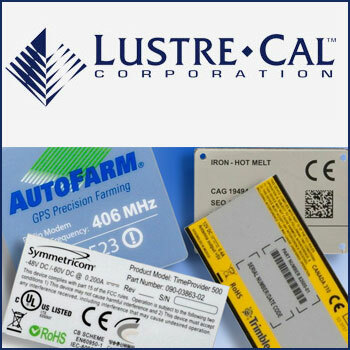 The company also produces high precision fasteners for farm equipment, automobiles, refrigeration units, and office systems; and blades, connectors, and contacts for the electrical and electronics industries. DiVenere said that many of his customers refer to Gemco as a “low maintenance” vendor or business partner. “ Gemco will always help assist in managing a customer’s part through the design and manufacturing process, so that the customer doesn’t have to,” he said. The company maintains full control over production, designing and fabricating all tooling in-house. To aid this process, DiVenere said, Gemco will ask its customers about their expectations regarding forecasted annual production demands and durations of their projects. “These factors provide us the opportunity to quote a production tool that will meet the customer’s demands with regard to dimensional accuracy and overall quality, while keeping in mind the need to ensure that the tool investment is manageable,” he said. The company’s tool makers are trained through a combination of state apprenticeship programs, on-the-job training, college, and manufacturer training for new equipment. Gemco bought its first EDM machine in 1994, and its tool makers at the time liked it. “It provided Gemco with the opportunity to manufacture more precise tools and modify those tools when and if it was necessary, without having to start over,” DiVenere said. “They select the tool steels—it’s really dependent on the metal the component is produced from and the volume we’re working with,” DiVenere said. “Higher density is used for the higher number parts. Certain tool steels perform better with certain metals—experience teaches that. We discuss it with the tool steel suppliers, who make recommendations. The selection is the result of conversations between the toolmakers and the tool engineer and is based on experience. They know if the metal will work for that particular application. A view of Gemco Manufacturing’s factory floor. The Southington, Conn., company’s in-house capabilities offer customers two methods of metal stamping: four slide and power presses that run progressive dies. A fourslide tool can take two to 10 weeks to make. “The time to completion is based on the complexity of the part,” DiVenere said. The cost of these tools ranges from $2,500 to $25,000, “again, depending on the complexity of the component. I would estimate the average tool investment (in-house) to be around $6,500,” he said. One customer approached Gemco with a stainless-steel part already being made by a competitor, but the customer felt it was paying too much. Gemco offered a lower price, but the customer wanted Gemco to use the existing tool. 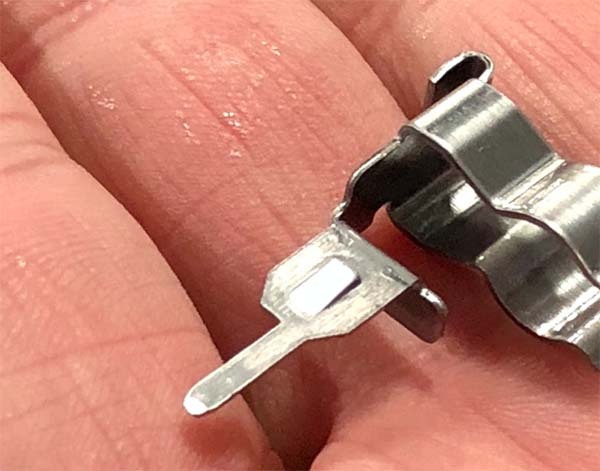 DiVenere explained to the customer that it was paying a higher price for its parts because of the tool that its supplier—Gemco’s competitor—designed. He said that if Gemco had designed the tool, there would be less wasted material and the parts would be less expensive. “It’s a more efficient use of materials,” he said. Effective communication remains essential throughout the entire design-through-production cycle, beginning with the request for quote. Depending on the part and the customer requirements, Gemco can tap and insert contacts into a part as it is stamped, without any secondary process. It can also insert rivets, PEM™ fasteners, and screws during the stamping process. In general terms, its engineers look to find cost savings by slightly modifying the proposed design, or by adding features or minimizing material waste. DiVenere said that reaching the right precision and right price involves fixing problems before they arise. That means raising questions early in the design process. He emphasized that by working with Gemco’s engineers and trusting their design and manufacturing expertise, customers benefit during the design stage.